At its simplest, advisory boards are groups of subject matter experts providing a company’s leadership team with guidance on company vision, innovation, risk management, and profitability. Though they provide management with advice, they do not possess the authority to vote on corporate matters. A 2014 Canadian study by the Business Development Bank of Canada polled over 1,000 small and medium-sized enterprises (SMEs) to reveal that only 6% of SMEs have access to an advisory board, yet 80% indicated that they’d set up an advisory board again. In a ten-year study, annual sales of businesses with advisory boards were 24% higher than those of the control group. Productivity was also 18% higher for those with advisory boards. According to a Wall Street Journal article, 50 of the Fortune 500, including General Electric, American Express, and Target, have set up digital advisory boards, typically comprised of six experts under the age of 50. Compensation. The company should always provide something—whether it be paying for meals, travels, an honorarium, or even offering equity at some juncture. Startups should pay $100 to $500 per meeting, host a meal, and cover any incidental costs. In large corporations, the annual compensation paid to advisory board members is normally between a third and half of what’s paid to regular board directors. A global survey conducted by the Advisory Board Architects found that 15% of private company boards paid no compensation, 25% paid only cash, 43% only equity, and 17% paid cash and equity. There is anecdotal evidence of ROI for advisory boards (returns of over $100 million for large companies to higher evaluations for startups), but it’s difficult to pin down representative statistics. There’s a specific objective and internal resources are not equipped to execute. A company with specific needs such as making an acquisition, selling the company, entering a new market, or raising capital can benefit from an advisory board. The company would benefit from positive association. Advisors typically have impressive track records that corporations want to affiliate with. When a company showcases its advisors, it demonstrates that it’s surrounding itself with key opinion leaders and that these leaders are invested in their success. The leadership team has skill gaps. If the company cannot justify hiring full-time employees, advisory boards can provide perspective it’s not getting internally. The most common needs are in accounting or finance. The company plateaued or is in a rut. If a company feels too entrenched in a given set of processes and product offerings, it could benefit from an advisory board’s fresh insights. This is especially impactful for companies that have hyper-political and entrenched cultures. Identify your needs. Identify what the company needs to achieve with an advisory board. The more specific, the better—a measurable strategic outcome is ideal. Figure out how these goals are tied to mission, vision, strategy, and milestones. Draft job descriptions. The company needs to draft written profiles of ideal candidates. Once the profiles are written, then an advisory board job description can be drafted for recruiting and informing candidates on roles and expectations. Prospective board members should not have a pre-existing relationship with the company or its management team. Source and recruit. Don’t hesitate to do cold outreach with candidates unfamiliar with the company. And, don’t be overly concerned about waiting for the right moment. Only after engaging with multiple candidates should a decision be made. Make sure to thank the candidates who were not selected and let them know that you would like to stay in touch. Finalize contractually. When candidates agree to join as advisors, it is important to have them sign a job description or a memorandum of understanding. While advisory boards can be fairly informal, utilize formal documents to set the tone and demonstrate the seriousness of the board. Set key performance indicators. It is important to work towards milestones, measure outcomes against KPIs, and swap out members when they are no longer a fit. Don’t be shy in executing evaluations—good advisors will want goals and to be held accountable. Advisory boards are undoubtedly controversial. While many articles sing their praises (see here and here), others condemn them as mere headshots in pitch decks. The truth is that advisory boards are usually not silver bullets. Still, they can be powerful tools and yield strong returns on investment (ROI). However, they must be properly utilized with an analysis of the cost against the rewards of achieving strategic objectives. Otherwise, they can be a substantial waste of time and resources. As a former medtech analyst and investment banker, I’ve seen many healthcare companies utilize scientific advisory boards to understand their clients, often medical doctors. Since then, I’ve witnessed the broadening of advisor usage, especially by early-stage businesses with acute needs they can’t otherwise afford. Having personally served on three advisory boards, organized advisory boards for two of my businesses, and assisted multiple corporations in establishing them, I’ve seen firsthand both how advisory boards can achieve substantial ROI and where miserable mistakes have occurred. This article includes an overview of advisory boards, their economics, when they can and should be used, and a step-by-step guide to building one. At its simplest, advisory boards are groups of subject matter experts. The role of an advisory board is to provide a company’s leadership team with guidance on company vision, innovation, risk management, and profitability. Though they provide management with advice, they do not possess the authority to vote on corporate matters. A 2014 Canadian study by the Business Development Bank of Canada (BDC) polled over 1,000 small and medium-sized enterprises (SMEs) to reveal that only 6% of SMEs have access to an advisory board, yet 80% indicated that they’d set up an advisory board again. The BDC also conducted a ten-year study from 2001 to 2011, finding that annual sales of businesses with advisory boards (307 observations) were 24% higher than those of the control group (300 observations). Productivity was also 18% higher for those with advisory boards. BDC now encourages its 49,000 clients to utilize advisory boards, with about 10% of their clients utilizing them. According to a Wall Street Journal article, 50 of the Fortune 500, including General Electric, American Express, and Target, have set up digital advisory boards, typically comprised of six experts under the age of 50. These groups coach management on everything from new marketing tools to emerging digital trends. Since 2011, GE’s digital advisory group has met quarterly, rotating members annually, pulling experts from areas such as gaming and data visualization. Borne out of these meetings was the GE Sound Pack, a popular app that helps electronic musicians produce tracks, when a then-26-year-old advisory board member suggested it. GE’s digital advisory board also proved valuable on the 45th anniversary of the moon landing, when it helped GE promote its role in the event, which had been to produce the silicon rubber in the astronauts’ moon boots. 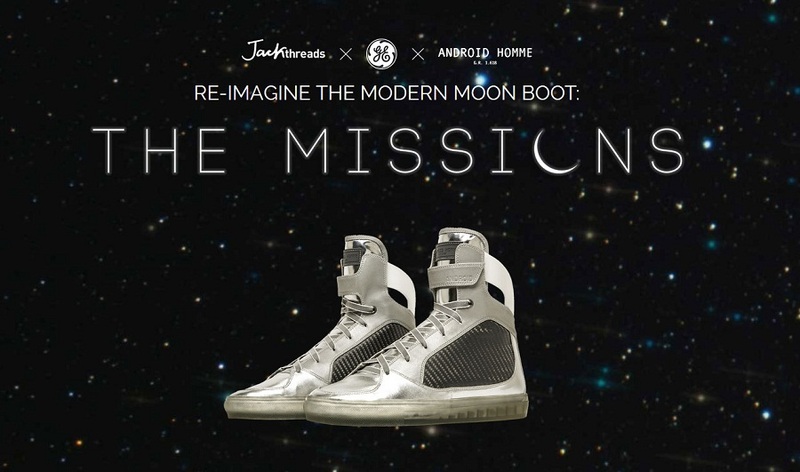 With guidance from the board, GE produced “moon boot” sneakers, which cost $200 a pop and sold out within minutes. Advisory boards and boards of directors (BOD) are often confused with one another. The crucial distinction lies in fiduciary duty, the legal responsibility to act in the stakeholders’ best interest via a construct of specific duties. While the BOD has the responsibility to influence corporate governance, advisory boards do not. Fiduciary duties are light on requirements to provide strategic insights around business growth. Without this burden of legal liability, high-profile individuals are typically more willing to accept the role of an advisory board member over a directorship. One of the fiercest debates around advisory boards is around compensation. While professional advisors suggest stipends in thousands per meeting and/or decent equity upside, entrepreneurs and retirees looking to “pay it forward” often insist a cup of coffee is adequate. Like most things in life, the truth lies somewhere in the middle. I believe the company should always provide something—whether it be paying for meals, travels, an honorarium, or even offering equity at some juncture. I encourage startups to pay $100 to $500 per meeting, host a meal, and cover any incidental costs. In large corporations, the annual compensation paid to advisory board members is normally between a third and half of what’s paid to regular board directors. A global survey conducted by the Advisory Board Architects (ABA) found that 15% of private company boards paid no compensation, 25% paid only cash, 43% only equity, and 17% paid cash and equity. Though the survey includes data from both fiduciary and non-fiduciary boards, the CEO of ABA indicated that most respondents were from advisory boards and that the compensation breakdown is in line with what they have seen for advisory boards. Interestingly, their surveys have found that boards paying only equity have the lowest impact. This is counterintuitive to the widely-held belief that equity participation provides the strongest alignment with achieving key corporate objectives. The survey also found that the boards with the most impact were paid cash and equity. Interestingly, in the BDC survey of only advisory boards, a whopping 57% of advisory board members were uncompensated. When I interviewed Pierre Cléroux, VP of Research and Chief Economist at BDC, he noted that most advisors in Canada simply want to help small business owners succeed and don’t view it as an avenue for personal enrichment. We also discussed the striking difference between US and Canadian startups in their willingness to provide equity to advisors. Cléroux stated, “We have found that it is very unpopular with Canadian entrepreneurs to share equity. They save it for financings and want to control the business.” Canadian founders typically reserve equity for the BOD. Another cost consideration is the size of the board. While there aren’t definite size requirements, a University of Pennsylvania study concluded that collaboration falls off after six people. In line with this research, the BDC Study found that advisory boards were an average size of five. Matters become more complicated when it comes to offering equity, something that’s debated extensively. For an established company, equity makes little sense since they can pay in cash. However, a startup may be tempted to offer a few percentage points in exchange for access to big-name advisors. Founders should tread lightly here. It could be a red flag if an advisor insists upon a large stipend or a decent chunk of equity immediately. Equity incentives can be very expensive and could reflect poorly on the founder’s judgment should the advisor eventually yield little to no value. In situations involving equity, I recommend that advisor relationships start out in a honeymoon phase, with equity available only after the advisor has provided tangible value and vested upon specific milestones. Once, a tech founder hastily drafted an email to a potential advisor, offering what seemed like 20% equity. Given these supposedly generous terms, the advisor quickly agreed. However, issues arose when it was time to formalize the deal. The founder was actually offering 20% of the option pool (20% of a 10% option pool would equal 2% of total shares). Meanwhile, the advisor was expecting 20% of the entire company! Fortunately, I facilitated a solution by demonstrating that 20% of the company was far above benchmark terms and that offering this amount would adversely affect the company’s ability to raise capital. It’s worth noting that an advisory board is not necessarily the most effective (cost and otherwise) method of attaining advice. Alternatively, current employees, new hires, or third-party services could potentially get the job done better and faster. Therefore, advisory board members should possess an x-factor, such as an exceptionally valuable network or experience. While there is anecdotal evidence of ROI for advisory boards (indicating returns of over $100 million for large companies to higher evaluations for startups), it’s difficult to pin down representative statistics. However, we can borrow from ROI frameworks used by companies considering customer advisory boards to engage with current and prospective customers. As such, analyzing ROI for advisory boards should be treated as analyzing any other project in corporate finance. You must consider the cost, potential return scenarios, and the weighting of the risk/return vs. other investment opportunities. Let’s assume a young technology company is assembling a five-person board to aid their new product launch, scheduled in 18 months. The new product has taken $5 million to develop and the annual revenue opportunity is in the nine figures. From the advisory board, the company hopes to receive: 1) three new distribution leads from the advisory board, 2) connections into influencers in the space, including social media influencers or simply those known in the industry, and 3) positive PR around the advisory board to drive website visits and social media engagement. The board is set to meet five times in the next 18 months. In this example, the company would yield a significant ROI if the board lives up to its expectations. The product launch has already been a $5 million investment, and the advisory board could be considered an insurance policy. Costs are fixed and in the control of the company, whereas the upside can be exponential. Still, the only thing guaranteed is costs, so it’s important to weigh the likelihood of the outputs. If the company is hiring people for the new product line and is unsure about how to engage distribution channels, then an advisory board could prove valuable in ways not understood at the outset. These can include introductions to highly qualified potential employees, insights on go-to-market strategy, and pricing and scalability recommendations. There’s a specific objective and internal resources are not equipped to execute it. A company with specific needs such as making an acquisition, selling the company, entering a new market, or raising capital can benefit from an advisory board. According to Bob Arciniaga, Founder of Advisory Board Architects, advisory boards working on a strategic outcome are the most successful. Transformational events are challenging for leadership teams because they add stress and risk distracting management from core responsibilities. An advisory board can help. For example, if a company seeking capital assembles a board to complete the round of financing, the advisors would be tasked with identifying sources of capital and guiding management through the fundraising process. The project would be measurable and specific. The company would benefit from positive association. Advisors typically have impressive track records that corporations want to affiliate with. The opportunity for a company to showcase its advisors can demonstrate that it’s surrounding itself with key opinion leaders and that these leaders are invested in their success. The leadership team has skill gaps. If the company cannot justify hiring full-time employees, advisory boards can provide perspective it’s not getting internally. This could be a member who provides feedback on inclusion and community relations. Or, it could be an advisor with knowledge about emerging trends tangential to the corporation’s core business. For example, a corporation with entrenched products may benefit from learning about millennial consumer trends. Advisory boards are an elegant way for executive teams to learn from individuals different from them. The most common needs are in accounting or finance (see below). The company plateaued or is in a rut. If a company feels too entrenched in a given set of processes and product offerings, it could benefit from an advisory board’s fresh insights. This is especially impactful for companies that have hyper-political and entrenched cultures since an advisory board can provide a safe environment for new ideas to percolate. After performing the ROI analysis and deciding to move forward, use these steps to get the process moving. The first step in the plan needs to identify what the company needs to achieve with an advisory board. The more specific, the better—a measurable strategic outcome is ideal. Figure out how these goals are tied to mission, vision, strategy, and milestones. 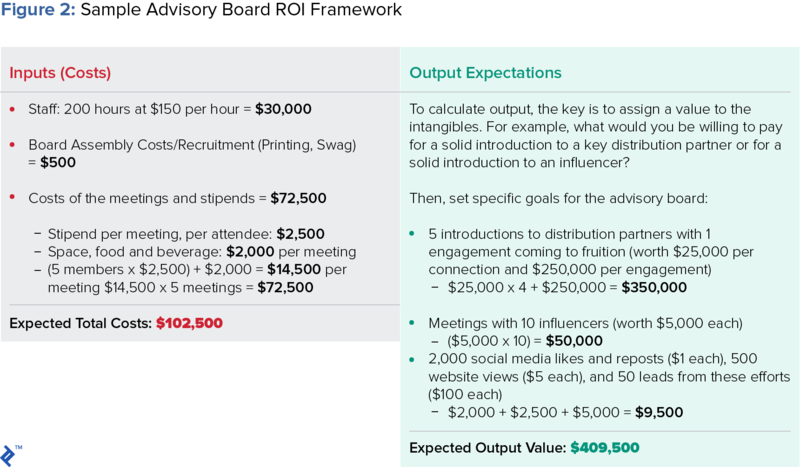 You will also need to determine if the time and expense of organizing an advisory board can provide a substantial positive ROI. Next, the company needs to draft written profiles of ideal candidates. It’s important that each of the profiles are unique, with a high bar of qualifications. A highly functioning advisory board will have a diverse set of views where the advisors can learn from one another. Once the profiles are written, then an advisory board job description can be drafted for recruiting and informing candidates on roles and expectations. This step is important since it lays the groundwork for finding who is needed versus already knowing a qualified candidate and reverse-engineering a profile to fit their background. With these documents prepared, it is time to identify candidates to fill the roles. As mentioned previously, prospective board members should not have a pre-existing relationship with the company or its management team—these people are essentially already informal advisors! Thus, don’t hesitate to do cold outreach with candidates unfamiliar with the company. In my experience, there’s usually a high response rate. And, don’t be overly concerned about seeking introductions or waiting for the right moment. Like all good sales processes, the time is now. Utilize your candidate profile and job description to reach out to candidates and strike up a dialogue. Only after engaging with multiple candidates should a decision be made. For one, it allows the company to absorb some knowledge during the recruitment process. Second, it ensures the right fit personality-wise. Make sure to thank the other candidates who were not selected and let them know that you would like to stay in touch. These budding relationships may prove valuable someday. When candidates agree to join as advisors, it is important to have them sign a job description or a memorandum of understanding. While advisory boards can be informal, it is important to utilize formal documents to set the tone and demonstrate the seriousness of the board. The agreement can be a simple one-page document outlining compensation and a set of expectations around time commitment and participation. It is crucial to have people sign this document prior to the first meeting. I’ve included an example that you can use to re-purpose for your own company here. Finally, it is critical to set objectives and key performance indicators (KPIs). It is important to work towards milestones, measure outcomes against KPIs, and swap out members when they are no longer a fit. In my interview with Bob Arciniaga, he noted his distaste for the term “sounding board,” stating, “There are much cheaper and easier ways to get feedback than trying to get a group of advisors together. The primary purpose of an advisory board should be to drive outcomes.” Finalize your KPIs and communicate them clearly. Don’t be shy in executing evaluations—good advisors will want goals and be held accountable. Don’t list the member on materials without approvals. Under no circumstances should an advisory board member be listed on promotional materials without the advisor formally accepting the position. This can be particularly true with overzealous startup founders eager to showcase the networks they’ve built. If the company overstates the relationship or makes comments on behalf of the advisor (i.e., “They think we’re going to be the next billion-dollar company!”), it can prove detrimental. Don’t under-communicate. I have witnessed companies fall out of sync with advisors, leading to advisors publicly speaking out of line about the company’s progress. I’ve seen this happen with a tech company who pivoted their target market but failed to share the updates with its advisors. Thus, when people in the industry asked an advisor about the technology’s total addressable market, he answered with a dated viewpoint, which negatively affected the company’s standing with prospective investors. It doesn’t take much for an advisor’s uninformed or outdated comments to reflect poorly on the company. Always err on the side of overcommunication early in the relationship and when there are shifts in strategy. Don’t let the relationship fester. Advisory boards should have a stated lifecycle tied to a key outcome. Otherwise, advisory boards can become directionless and a time sink. If an advisory board is set up to achieve a milestone, it should naturally end upon the realization of that milestone. In the rare case that an advisory board is set up with ongoing objectives, be sure to rotate advisors periodically. And, if an advisory board is not working for the parties, proactively shut it down immediately and move on. I’ve personally stumbled before by allowing a board I created for a company I have ownership in to never formally conclude. It was embarrassing when I later saw an advisor at an event and was asked, “So, whatever happened to meeting on a regular basis?” In retrospect, we should have had a nice dinner to signify the formal conclusion of the advisory board, and that we’d keep them updated on our progress. Are members of an advisory board paid? While professional advisors suggest stipends in thousands per meeting and equity upside, others looking to “pay it forward” often insist a cup of coffee is adequate. The truth lies somewhere in the middle. The company should pay $100 to $500 per meeting, pay for meals, travels, an honorarium, or even offer equity. At its simplest, advisory boards are groups of subject matter experts that provide a company’s leadership team with guidance on company vision, innovation, risk management, and profitability. Though they provide management with advice, they do not possess the authority to vote on corporate matters.